"Two titans of horror's love letter to the controversial EC Comics of the 1950's remains one of the most celebrated horror films, and the best horror anthology, in the past 3 decades"
Creepshow was released on this day in 1982, November 12th, 35 years ago today. Though Stephen King had been writing novels since 1976, with most of them immediately being adapted to the silver screen, Creepshow was his very first screenplay that he wrote himself. George A. Romero, fresh off the heels of his misfire Knightriders (1981), was looking for a hit. Since both he and King were personal friends looking for a project to work on together, the idea of a horror anthology was just too good to pass up. Little did these two horror giants know that this film, a love letter to the EC Comics of the 1950's, would go down in the history books for a number of reasons, not the least of which as one of the best horror anthologies ever made. While anthologies in general were never big moneymakers, something magical happened here at a time when horror just wasn't doing big business. Sure we look back at films like The Fog, The Thing, Halloween III, Alone in the Dark, Evilspeak, The Pit, The Beyond, The Prowler and Evil Dead and consider them classics today, which they very much are, but back then they were anything but. In fact, most of them were flops, or didn't even make it into theaters at all, only finding their audiences many years later on the home video market. 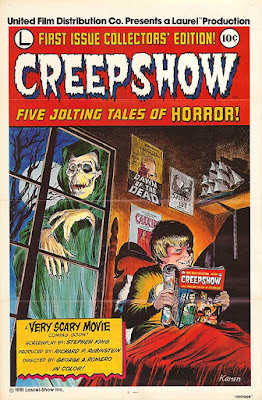 And while King had some recent success with his film adaptations of Carrie, Salem's Lot and The Shining, still, Creepshow very easily could have been a dud. Thankfully it wasn't, which is why we still love it today, 35 years later, and consider it to be one of the genre's best films, as well as one of the strongest entries in both George A. Romero's and Stephen King's filmography's. One of Creepshow's many enduring qualities is that it was made at just the right time, by just the right talent (all bringing their A-Game) in just the right genre. I mean, it's a winning trifecta of talent if there ever was one. Stephen King (screenplay), George A. Romero (director), and the legendary Tom Savini (makeup effects) delivered such fresh passion and energy into a genre that while prolific, wasn't really bringing anything genre-defining to the big screen. But that would change with this film. King, fresh off the success of several big budget high-profile adaptations of his novels, the most recent being Stanley Kubrick's brilliant The Shining in '81, Romero who misfired with Knightriders the previous year, but blew the roof off the zombie genre several years earlier with the legendary classic Dawn of the Dead in '78, and Savini, who was fast becoming one of the best special effects makeup artists in the business having previously worked on horror classics such as Maniac and Friday the 13th in 1980, as well as The Burning and The Prowler in 1981; all relatively new raw talent itching to deliver something memorable in their favorite genre. As we all know now, Creepshow was a massive hit for all of them. In fact, it was the only film in director George A. Romero's resume to ever open at #1. But that wasn't the case behind the scenes. The studio, either reluctant to go wide right off the bat because of other recent failures in the genre, or because they just weren't sure if what they had in their hands would connect with audiences, didn't release Creepshow wide theatrically in the beginning. Instead, they gave it a soft 4-week opening in Boston, which did stellar business. When Halloween III fizzled at the box office rather quickly, the studio saw an opportunity to go wide and capitalize on the Halloween season, which was just 2 weeks earlier. It worked, and Creepshow did great business, ultimately grossing close to 20 million dollars on an 8 million dollar budget. That's impressive business in the horror genre, and since that impressive release, Creepshow would go on to endure a long-lasting legacy as not only one of the best horror anthologies ever made, but one of the best films in the genre period. And it's not just Savini's, King's and Romero's involvement that makes it so great. The large eclectic cast, most of whom were little known at the time, make it so memorable. Seeing a young Ed Harris, Tom Atkins and Ted Danson, as well as well-known legends such as Leslie Nielson, Hal Holbrook and E.G. Marshall deliver some juicy performances in a genre that most of us would never associate them with is fascinatingly fun. Of course, we can't forget cult icon Adrienne Barbeau (John Carpenter's wife at the time), who would end up being one of the most memorable characters in the film, as well as being just one of many connections between John Carpenter and this film. Seriously, you could easily play "Six Degrees of Separation" with Carpenter's connection to most of the talent involved in Creepshow, such as; John Carpenter would direct Stephen King's Christine the following year (1983), Tom Atkins, Adrienne Barbeau and Hal Holbrook all appeared in John Carpenter's The Fog in 1980, and Barbeau was married to Carpenter at the time. You could certainly dig deeper if you tried, and make far more connections, but then we could be here all day. Looking back on it, it's almost astonishing that this film turned out as well as it did, when nothing really before it's production, especially not from the three major talents involved, lead you to believe they were capable of delivering something so exotic and unconventional. Romero had never shot a film before, or after, the way he shot this, by utilizing a strong primary color palette and comic book-style backgrounds for certain scenes that made it so distinctive, and quite frankly, remarkable. Writer/Director John Harrison, a close friend of both Savini and Romero, would also mark Creepshow as his soundtrack debut, providing an unforgettable score that is still going strong 35 years later. Harrison would go on to provide another memorably haunting score for Romero's followup to Creepshow, Day of the Dead in 1985. 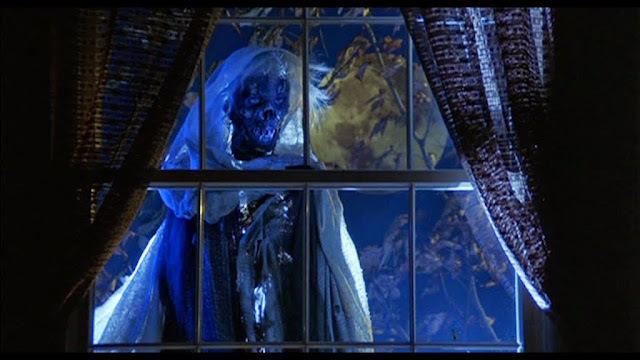 Creepshow continues to hold it's ground as a genre-defining film, even with 2 lackluster sequels in the franchise and countless imitators. What makes it all the more special is that King would try this formula again, just 3 years later with Cat's Eye, only this time - while entertaining - nowhere near the quality or legacy of Creepshow. While not perfect, as with any film, it has so much going for it that you can easily overlook some of the films weaker elements, and 35 years later it continues to be a highlight in the career's of all involved, most importantly King, Romero and Savini. There are countless releases of Creepshow to keep track of, including a bare bones 2009 Warner Brothers release on Blu-Ray, which I do not own so I can't vouch for it's quality. 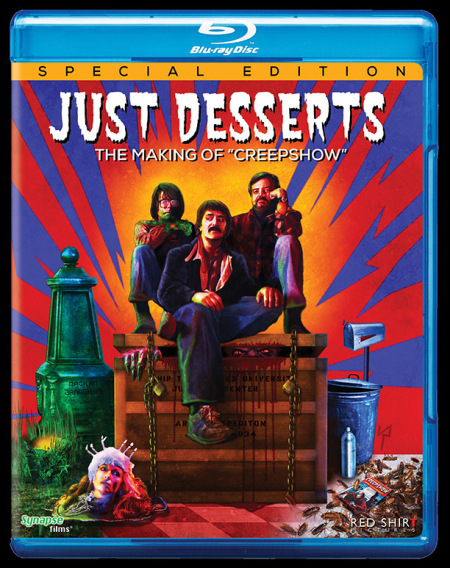 But what I do strongly recommend is the Synapse Films 2016 release Just Desserts: The Making of Creepshow, which is a 90 minute documentary detailing the making of this landmark film, with both new and vintage interviews, behind the scenes footage, and so much more. 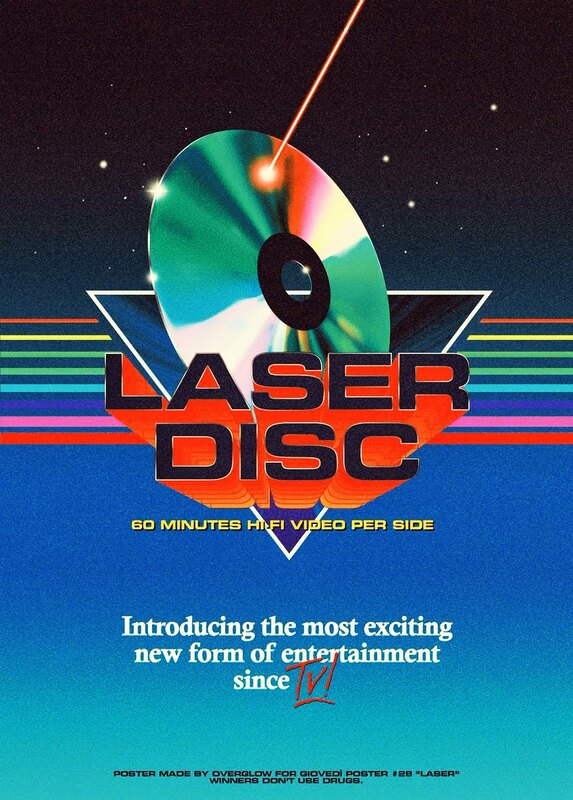 The documentary is just fantastic, but this Special Edition release also contains a host of other extras that will give you hours upon hours of fun as you dig through all of the insane content. Really, if you're a fan of this first film, it's a no-brainer; you owe it to yourself, as a fan of either of these horror giants, or just a fan of horror in general. You can pick this up directly from Synapse Films HERE, or on the secondhand market for cheap. It's worth every penny.